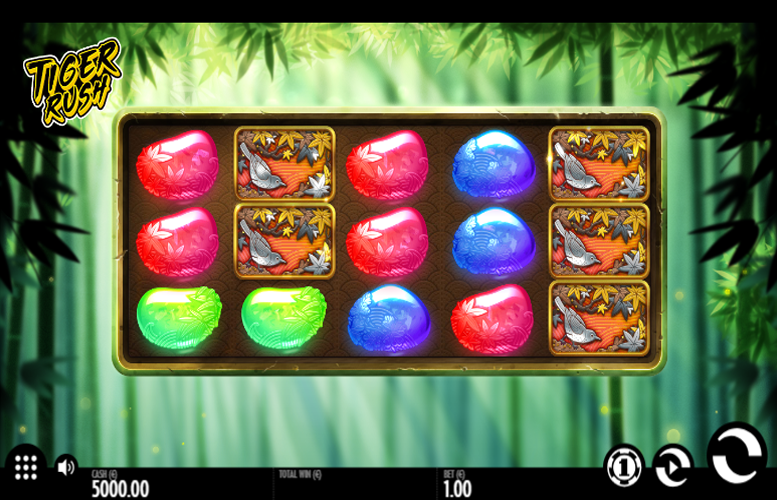 Prepare to be welcomed to the jungle on the Tiger Rush slot machine by Thunderkick. This one is a fun and vibrant looking game that offers players some interesting special features to boot. In terms of gameplay specifics, the action takes place on a beautifully illustrated five by three grid. During the title’s free spin mode, however, the middle three reels expand to offer an impressive 50 win lines (25 each way). This, of course, significantly increases the likelihood a player will win big! We’ll discuss this and everything else about this slot machine in further detail below. Great looking slot machine. The artwork is vibrant and the illustrations stylish on Tiger Rush. Interesting Bonus Game dynamic. It might not be a true second screen feature but the gameboard does transform for the free spin mode helping to keep the action fresh. Miserably low main game prizes. We’ve seen some slot machines award five-figure prizes in the past. This makes those offered by Tiger Rush seem miniscule in comparison. Theme is a little unimaginative and the features aren’t necessarily relevant to it. Birds = 15x the total bet. Flowers = 10x the total bet. However a max 1750x the line bet win is available via the bonus game. A tiger “wild” symbol substitutes for any symbol other that the “scatter”. The “wild” will occur on reels two, three, and four only. It always expands to cover the entire reel. Landing one or more “wild” symbols also awards a free extra spin. 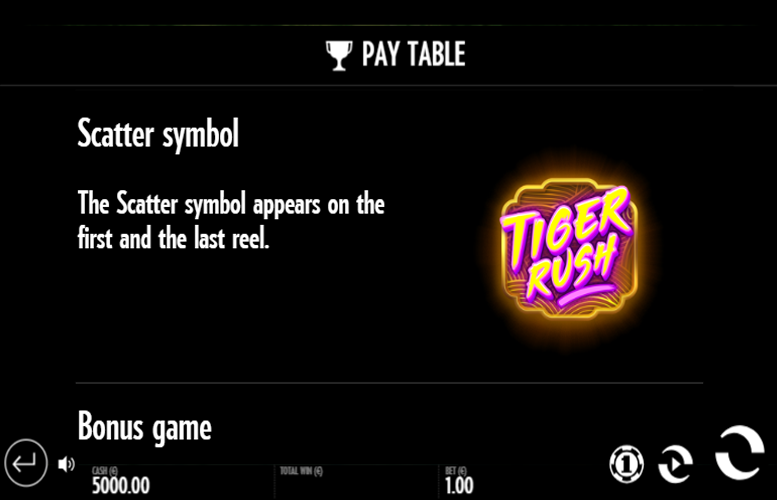 The Tiger Rush “scatter” symbol only appears on the first and the last reel on the Tiger Rush slot machine. Landing two of these “scatter” symbols will trigger the Bonus Game. 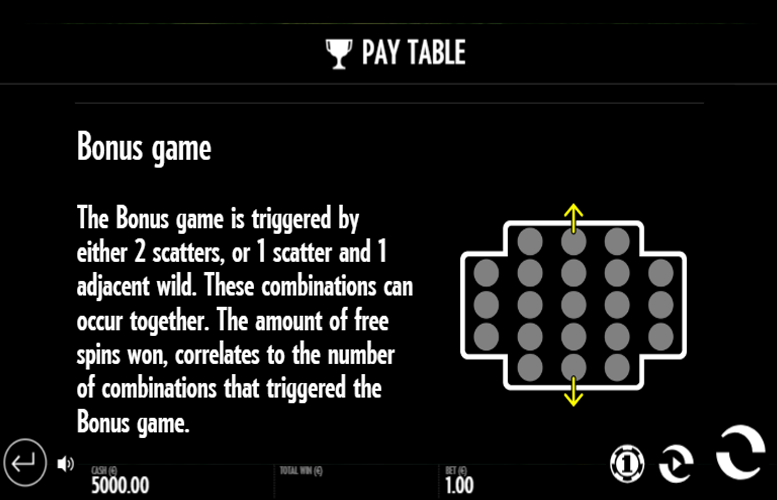 The Bonus Game can also be activated by landing a combination of a “scatter” and an adjacent “wild” symbol. Players should note that these combinations can occur on the same spin. The number of free spins awarded during the bonus game will depend on the combinations of triggers activating the feature. During the Bonus Game, the middle reels will expand from three to five tall. This of course increases the number of ways a player can hit a prize. To give players a greater number of chances to win big, Thunderkick included win lines that mirror the 10 main game and 25 Bonus Game win lines. Winning combinations can be formed going both left-to-right and right-to left. 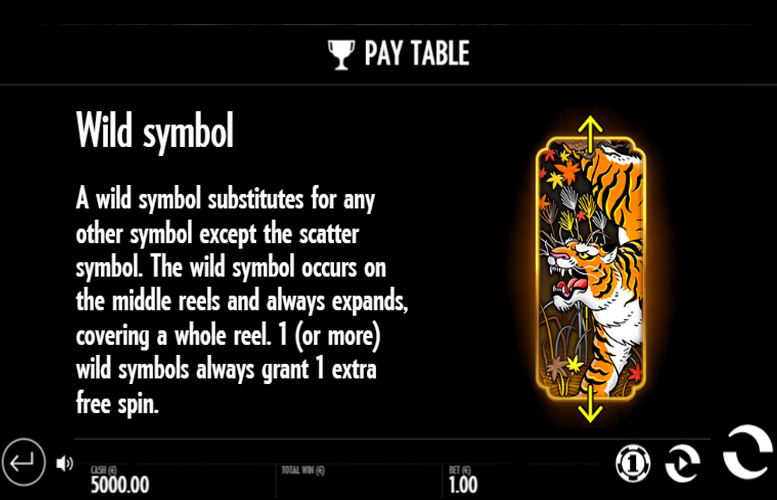 Along with the higher value symbols awarding the top jackpots on the Tiger Rush slot machine, there are also some symbols that grant smaller prizes. Rather than represent these payments using the upper end of a standard deck of playing cards as is common on modern video slot machines, Thunderkick instead used coloured orbs with faint depictions of the jungle within them. They look rather nice but their similarity to one another does feel a little lazy. Yellow orb = 5x the total bet. Green orb = 2.5x the total bet. Red orb = 1.8x the total bet. Blue orb = 1.6x the total bet. 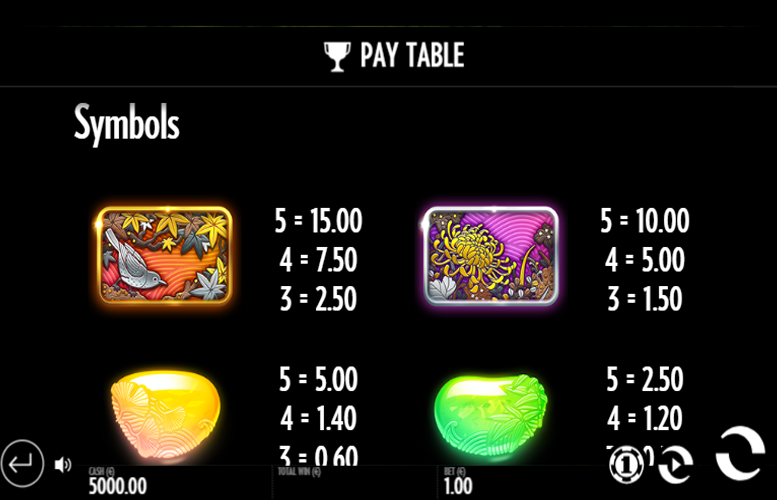 Purple orb = 1.4x the total bet. Whereas many slot machines allow players to adjust both the number of win lines played, along with the value of each bet placed upon them, on Tiger Rush players are simply presented with a list of 12 total bet amounts. These range from just 10p up to a rather impressive £100 per spin. We think most players should find these betting limits more than adequate. That said, some of the highest rollers around might think they’re a little restrictive. The Tiger Rush slot machine is a relatively strong title from Thunderkick. First impressions are great – the slot appears vibrant and the symbols have been nicely illustrated. Supporting the impressive visage are a few innovative game features. Chief amongst these is the expanding gameboard during the free spin mode. Unfortunately, Tiger Rush isn’t perfect. It suffers from a couple of flaws that stop it getting a much higher rating from us. Firstly, the theme is a little strange. We like tigers but what are their significance here? Secondly, the main game prizes are really small. If you’re a fan of games that can award life-changing money without even a sniff of a bonus feature, you’re certainly in the wrong place here. This game has a rating of 4 / 5 with 494 total reviews by the users.